There is no doubt, that politics has a profound impact on our daily lives though a majority of us could be disillusioned with politicians as a clan. This is because of the simple reasons that the governments we choose at various levels play an important role in our daily lives. They impact our quality of life and decide on the quality of our jobs and businesses. Hence, politics continues to play an important and significant role in our day to day living. It is obvious that we pay a lot of attention to political events and take a keen interest in it. While many of us do so out of interest for the specific political event, there also is big money involved in betting. Hence, betting on political events is quite common. If we add up the total amount of betting on various political events and happenings in the country and across the world, it could run into millions of pounds not only in this country but across the world. Let us learn something more about political betting over the next few lines. 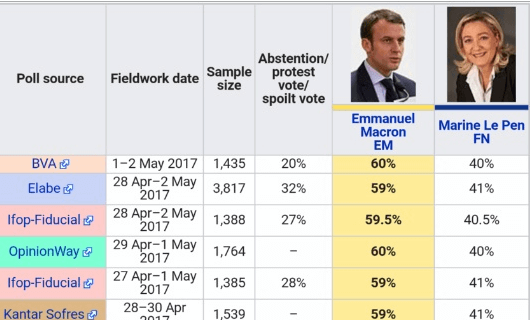 Which Political Events Are Betted Upon? There are almost scores of political events on which betting can take place. It could pertain to various elections which keep happening not only in our country but across the world. It could also be regarding elections of new Prime Minister in our country or across the world. Then, there are the various political events and elections for the post of the President of the USA and many other such countries. There are also bets placed on various activities within the various political parties and so on. Hence, at the end of the day, there is no doubt that we are bound only by our imagination when it comes to selecting the various political events as far as betting is concerned. It would be not a bad idea to get started with the political events which take place almost daily in the United Kingdom. Hence, if you look at some of the best online betting companies like Ladbrokes, Paddy Power, and others, you will find that they devote quite a bit of time and resources for offering bets on various political events which keep happening in the United Kingdom and other countries of the European Union. They also cover quite well the various political events which happen in other important countries like the USA, India, Russia, China, Japan and many other countries. We will try and look at some such events because covering the entire events would not be an easy task, to say the least. Who Will Be the Next Prime Minister of Great Britain? Whenever mention is made about the next Prime Minister of Great Britain, it certainly evinces quite a bit of interest there. For example, Boris Johnson as of now has quite a bit of popularity. This is evident by the odds of 6/1 which he enjoys right now in various sites like Ladbrokes and Paddy Power. The same is the case with Jeremy Corbyn who also enjoys a decent 6/1 odd in his favor, and it might become even more favorably as days pass by and as we come nearer to the next elections which are quite some time away. Which Will Party Win the Next General Elections? When we talk about various betting political events that are coming up in the UK, the impending General Elections without any doubt do evince a lot of interest. As far as elections in the UK are concerned, though there could be many parties, the contest has always been restricted to two main parties, the Conservatives and the Labor Party with Liberals making it to the third place (quite distant). There are a few other parties too, but they do not stand much of a chance, except for winning a seat here or there based mainly on the strength of the individual candidates. 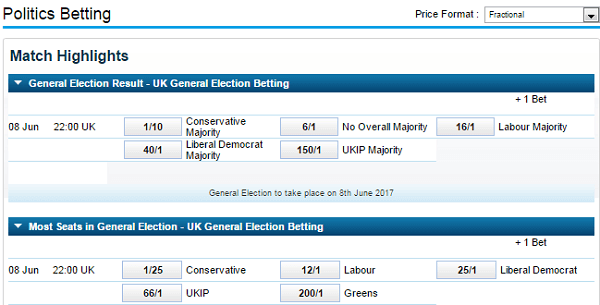 What Do the Bettors Say About General Elections in the UK? Though the next general elections are quite a few months away, there is a lot of interest being generated about as of now the Conservatives continue to be favorites amongst many punters. They have an impressive odd of 1/4 odds from most of the online bookmakers. This proves that they continue to be favored by most British people because of various reasons. Hence, the Labor Party may have to do something different and think out of the box if they wish to catch up with the Conservatives. However, it would also be pertinent to mention that the Labor Party has an odd of 10/3 which is not too bad and there are certainly ways and means by which they can catch up with the Conservatives. The way the Conservatives run the government over the remaining period is also something which could have a big impact as far as the next general elections are concerned. There are other parties like the Liberal Democrats, UKIP, and Greens which as mentioned above actually do not stand much of a chance. For example, Liberal Democrats have an odd of 20/1 as of now and as the nearer the general elections they will certainly face a lot of competition and heat, and the odds will certainly come under more stress, to say the least. Others like Greens and UKIP can at best be referred to as also-rans because of their limited impact on the voters and that too in some small pockets. The above are just a small example of the huge world of political party betting, and there are also other political events which continue to evince quite a bit of interest. For example, though Trump has taken over as the President of USA, he continues to be embroiled in one controversy over other, and there is betting done to find out whether he will be impeached or not. Then, there are other impending events like the Indian political arena and how Putin will handle his economy and political opponents locally which also could be areas of interest for punters as well as bookmakers.